ILLUMINOTRONICA, the Made in Italy fair dedicated to the production chain of Light, Domotic and Security, has just concluded its sixth edition, confirming to be the reference meeting point more and more evolved and farsighted, able to grasp and promote the emerging trends of the integrated technologies and with the highest grade of innovation in the sector of integration. The whole space of the fair has transformed for three days in a huge thinking net where technologists, professionals, businessmen and simple passionates of innovation – in addition to the satisfaction of closing some good deals – have discussed. reasoned and “lit up” together new ideas, on the wave of a silent as well as not at all obvious direction: the optimisation of the solution in favour of the quality of life and the wellness of the person. The human dimension has been in fact the common denominator and surely the winning factor of this edition, something that we all have sensibly perceived in the many facets of this rich as complex fair. Particularly noteworthy in that sense, the contributions to culture and education, with the Smart Pro Academy, but above all with an intensive programm of conventions, endorsement courses, educational pills, business workshops and debates which have been hosted in the very central Agorà and the side Arenas, each dedicated to a specific sector deepening. “Luce e suono – La sensibilità Artistica e la Tecnica del Lighting Designer e del Sound Engineer” , “La domotica a misura d’uomo – L’integrazione di domotica, lighting e sicurezza al servizio delle persone” or “Feltre: Porta attiva delle Dolomiti – L’intelligenza elettronica al servizio di cultura e turismo” are just two of the many moments of encounter offered, which have meet the passionate participation of the audience – there was also a relevant presence of students – both for the innovative approach to the contents and for the possibility to interact with the relators in a dynamic and pragmatic way, not ultimate for the audacity to demand clarity about shadows and side effects correlated to the technology evolution. 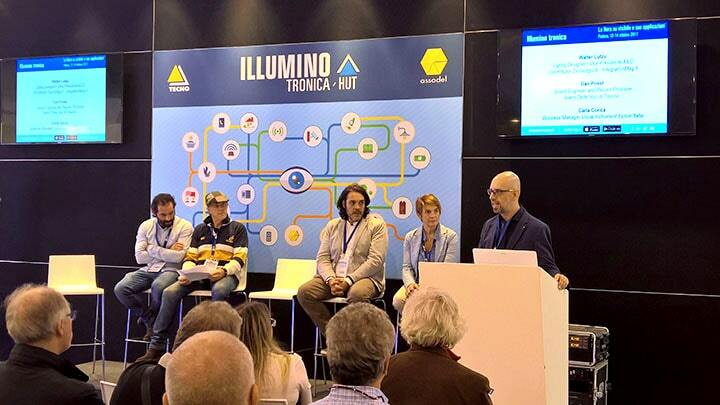 IntegrationMag has been involved directly in one of the many conventions and talk shows, “Luce e suono – La sensibilità Artistica e la Tecnica del Lighting Designer e del Sound Engineer“ (Light and sound – The artistic sensibility and technique. of the Lighting Designer and the Sound Engineer) During this convention IntegrationMag, represented by Andrea Gascone, Marketing Manager and Responsible for the publication, has coordinated, introduced and moderated the various intervention of Carla Conca for Epson Italia, Walter Lutzu for AILD and Dan Priest, together with Davide Florian, for the peculiar reality of the Teatro Delle Voci. It has been an interesting reflection about the combination of oestrus & technology in the different fields of sound, light and video, where has emerged the fundamental importance of the ability to perfectly balance art and tech. This condition allows technology to be expressed at its best, and the professional/artist to truly represent the excellence of his/her ideas. The speakers have developed, through some case histories and their own experience, a real educational path with precious advices to approach at best the projectual process. The initiative “Ask the espert“ has represented a special added value. Thanks to the virtuous collaboration with associations as AILD (Associazione Italiana Lighting Design), SIEC, Fondazione Fenice, NT24, ITER, AIRE, the visitors could benefit of a free service of professionale consultancy about the choice of the more suitable products for any kind of application or just to get answers about doubts or simple curiosity related to the fields of Lighting, Multimedia, Energy, Security, Installations and Integration. 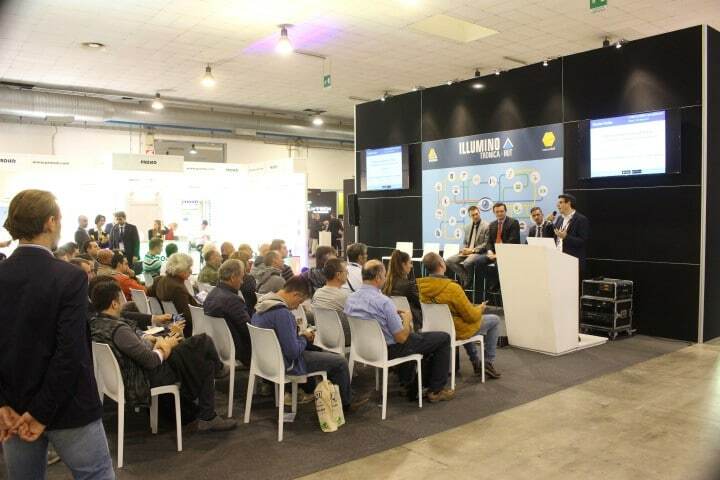 This initiative has been particularly favourable not only for the visitors of the fair but also for the same exhibitors: for them the opportunity to do professional and “interdisciplinary” networking, and to collect important creative suggestions. Of particular interest the special initiatives, as the Smart Village – an installation of 200 mq with integrated solutions for indoor and outdoor aiming to the Energy Efficiency, Security and Comfort – the IoT and Cybersecurity area – dedicated to the embedded, wireless and display solutions – the Smart Lighting – a section dedicated to the evolution of Lighting within integrated systems, with a particular care for design – the International Area – that hosted meetings B2B for Productors, Distributors, Retailers and CEM encouraging new business partnership and international opportunities – and the Albo SmartPro, where one could get directly within the fair the official certification as “Installer”, based on the new guideline UNI CEI TS 11672:2017, and much more. Thanks to a collaboration with BACKtoWORK24, a society by Gruppo Il Sole 24 Ore, and under the aegis of Assodel Foundation, this year again ILLUMINOTRONICA has dedicated an entire section to the world of the startups that have presented remarkable solutions in the field of Electronics, Lighting, Health Care, Domotic e Security. Very smart creations as for example ALLINWALL or IoKITCHEN, to just name two among many, show how the art of integration, especially to the young generations, represents a powerful stimulus to creativity and optimisation of the function. And then the Codega Award 2017, to crown it all – the international Lighting Design acknowledgment, which this year has been taking place within the marvellous frame of Palazzo Foscarini, at Stra (Venice). The initiative has seen the participation of over 40 projects for the category “Lighting Design” and 30 products for the category “ LED solutions”, testifying the qualitative growth and the international breath of the prize. The winner for the category Lighting Designer has been awarded to the lighting project for the Strasburg Cathedral, by the french studio Acte Lumière. A very exciting night, with an excellent parterre of professionals. At the end of the fair – and this is really the case! – the real emerging trend is what can be defined as IoM, the INTERNET of MINDS, meaning that extraordinary, dynamic interconnections of actors and audience increasingly experienced, mindful and demanding about the pursuit of the optimal solution and method of application of the technology which aims to the quality of living, rather than the performance sensationalism of the product, and which perfectly matches ILLUMINOTRONICA 2017’s motto: generate, manage and control. A new era has just begun.